…exclusive, each 2" x 2" x2" candle has a white frosted glass holder decorated with a block lettering Love and complementary abstract heart design with a poured white candle inside. 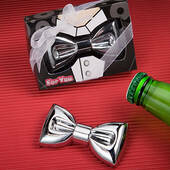 Each comes individually packaged in a clear plastic box tied with a white organza bow and an attached thank you tag. 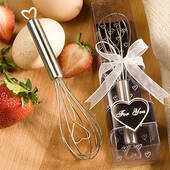 …and inner wire whisk that playfully forms a heart shape. 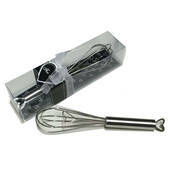 Each whisk favor, sold only by Party Supplies Delivered, comes individually packaged in a deluxe clear box with a black and white heart design base, tied with a white organza bow and wrapped with a matching heart design "For You" message. 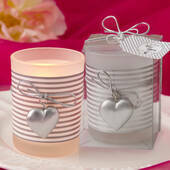 …2" tall favor features a frosted glass candleholder resting on a white and silver resin base decorated with two large interlocking heart outlines and smaller solid hearts. 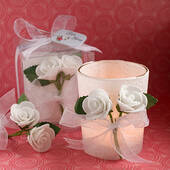 These candleholder favors come packaged in a deluxe box tied with a white organza bow and a heart-shaped thank you tag attached. 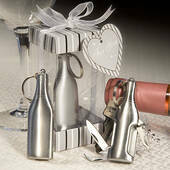 …From Party Supplies Delivered's exclusive "Amore Stainless Steel" collection, each comes attractively packaged in a signature clear plastic display box with a silver, black and white striped top and base, tied with a white organza bow and an attached matching striped heart shaped "For You" tag. 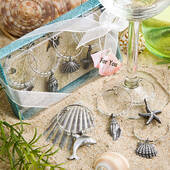 …in the set are four beach-themed wine charms each depicting different treasures from the sea including shells and more. These charming favor sets come attractively packaged in a matching beach themed deluxe gift box tied with a white organza bow and finished with a sea shell-shaped for you tag. 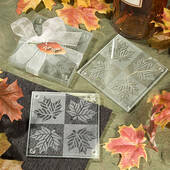 …made of clear glass with an alternating clear and frosted block design festively decorated with a detailed leaf in each square. Certain to be a useful addition to your guests' homes, each set comes packaged in a clear plastic box tied with a white organza bow and attached fall themed "For You" tag. …three dimensional chrome snowflake perched at the top. 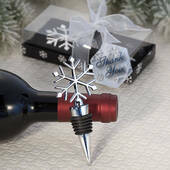 Sold only by Party Supplies Delivered, each wine bottle stopper comes individually packaged in a deluxe box with a clear top and black, snow-flake decorated bottom, tied with a white organza bow with an attached snowflake design thank you tag.